The company hand-picks each USA-made item included in the (reusable) gift box for your dog or cat. And it introduces you to each item before you purchase the box. A walrus spied lounging on Peedie Beach in northernmost Scotland is believed to be the first such tusker to reach the UK mainland since 1954. Whether or not it is a potent potable or not, it is nice to carry a bit of your favorite libation with you. This cool Cat Flask is a great way to have a bit of "nip" with you. Here I am out in the wilderness with my tent all set up and I'm ready to start my campfire. There is only one problem. 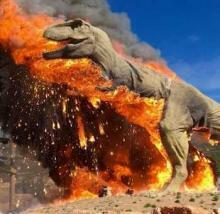 . .
An animatronic T-Rex at a Colorado theme park finally joined his flesh & blood kin on the ash heap of history after a (Jurassic) spark set off a roaring conflagration of fire and fury. With this bed I get to dream of living on the plains of America's past. I am right there among the herds of buffalo and antelope. Can Moco Lucero Really Register To Vote? There are old stories about people stuffing the ballot box for their favorite candidate by having dead people "vote." There is a new twist on this.